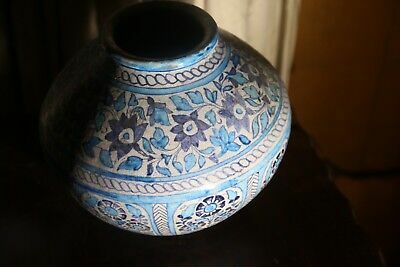 Seller: peakxv (1,043) 100%, Location: Rothesay, Ships to: Americas, Item: 132974136433 Onion shaped Islamic Pottery Hala pot with iconography arranged in panels or cartouches depicting flora from the Indian Subcontinent. Measuring 10" and an impressive 3 feet in circumference around the middle of the pot's belly. . Persian, Sindhi, British influence excellent, rare antique piece for any and all pottery collections. Expert, ,Safe, Well Padded Shipping provided to all destinations on the globe. Condition: In very good overall condition commensurate with age. Glaze loss to rim, foot, and one glaze chip in one cartouche. See photos for actual condition. Popularity - 28 views, 0.6 views per day, 49 days on eBay. High amount of views. 0 sold, 1 available. 28 views, 0.6 views per day, 49 days on eBay. High amount of views. 0 sold, 1 available. Seller - 1,043+ items sold. 0% negative feedback. Great seller with very good positive feedback and over 50 ratings. 1,043+ items sold. 0% negative feedback. Great seller with very good positive feedback and over 50 ratings.